Enjoy the fireplace, the bedroom and the kitchen. Then step outside into the Minnesota wilderness for a walk, bike or hike. Chateau LeVeaux Unit 2 is a 1 bedroom, 1 bathroom lower level unit. There is a full size futon ideal for kids and wood burning fireplace in the livingroom. Additional seating in the living room means there`s room for the whole family to sit back and enjoy. The bedroom area is divided from the living room but bifold doors. Leave them open for an open layout feel... ...or close the bifold doors for privacy in the bedroom. Unit 2 is cozy and charming with an open lay-out. There is seating for four at the kitchen island that doubles as a kitchen work space. The renovated kitchen includes full sized stainless steel appliances. The cozy cabin themed bedroom will make you feel like you`re in a private cabin in the woods. You will love the queen sized bed and unique feel of this bedroom. Again, the bilfold doors can be opened so you can enjoy TV from bed. Or you can close them for privacy. The bathroom features a large vanity for getting ready in the morning before your North Shore adventures. This unit features a unique two-person jetted tub. Enjoy soaking away your sore muscles after a day of hiking, biking, or skiing. Chateau LeVeaux is a 34-unit vacation rental resort located on Lake Superior`s North Shore. The large lobby is a great meeting area for large groups renting multiple units. Enjoy your breakfast in the community lobby area. Complimentary coffee is available for you to enjoy in the mornings. The community deck has plenty of room for large groups to gather. Or just you and your loved one sipping coffee and enjoy the Lake Superior views. Enjoy an outdoor meal on the community deck. Take a dip in the heater indoor pool. The pool area also has a hot tub, sauna, and a game room, great for kids On the grounds of the resort there are lots of places to grab a seat and enjoy the view. Or head down the stairs to the private lake front area. The lake front area in from of Chateau LeVeaux is ledge rock, great for sitting and watching the waves roll in. The gorgeous views looking up the shoreline. And don`t forget the views looking down the shoreline The community fire pits are also a great place to gather and enjoy time with friends, family, and other Chateau guests. Map of Chateau LeVeaux property. This lower-level condo rental has it all. This beautiful,l romantic, vacation condo at the Chateau LeVeaux Resort on Lake Superior is located in the resort's west wing. It is perfect for a romantic getaway or a private retreat. Here you are just a short drive away from the beautiful Oberg Mountain Scenic Overlook and hiking trail, a must-see during leaf changing season. Head down the shore and check out Temperance River State Park or head up the shore and you will find Cascade River State Park - both great for hiking and enjoying some beautiful waterfalls. The Gitchi Gami Bike Trail goes right in front of the resort and runs along Highway 61. The trail is enjoyed by bikers, as well as walkers, taking a scenic ride or stroll along Lake Superior's shoreline. The Lutsen Mountains recreation area is just 10-miles away and offers both winter and summer activities including skiing, the alpine slide, and a scenic gondola up to the Moose Mountain Summit. Enjoy the many restaurants and live music offered year-round on the mountain, as well. 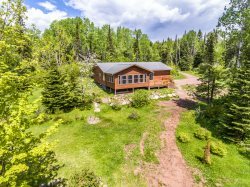 "Relax on the futon or comfy swivel rocker recliner which face that beautiful Lake Superior view, while enjoying the wood-burning fireplace and large flat screen TV. Enjoy the stainless steel kitchen with dishwasher and dining table. Rest and relax while soaking in a large jetted tub. The romantic bedroom features log-cabin walls and wide double doors that open to the living room. Private walk-out patio with dining table and nearby grill (in winter grill may not be accessible due to snow) and fire pit overlooking Lake Superior are just mere feet away. This condo rental has it all!" Dogs are welcome with prior approval and an additional fee. 2 dog maximum. Holidays require a 3-night minimum stay on all Chateau LeVeaux properties. Layout was nice, bed was very comfortable, appliances worked well. Did not like the shower head. Difficult to use while on wall. Cooking utensils were lacking. Pan selection was narrow and there were no baking dishes. Dishwasher left chalky streaks on dishes. Overall, very nice stay, friendly staff, and comfortable room. Only mention dishwasher, shower, and utensils to improve future users' experiences.